Guided tours allow students and visitors to broaden their understanding of the history, heritage and culture of the cattle industry. Led by our Museum staff and trained volunteers, these visits encourage critical and creative thinking while addressing all learning styles through a close review of historical artifacts and interactive gallery experiences. 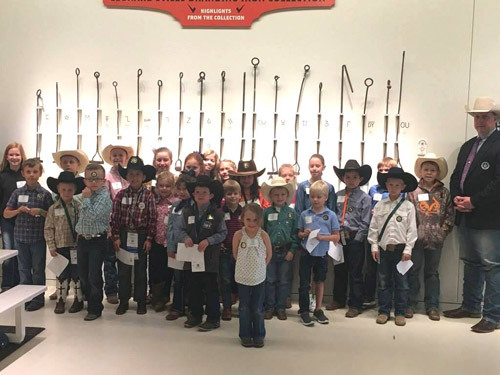 To request a guided tour or for further information, please contact us at cattleraisersmuseum@gmail.com or call 817-332-8551. When emailing, include your name, school, requested date and contact information. The Museum also provides opportunities for self-guided groups to independently explore the Museum’s collection and special exhibitions. The voice of the legendary Red Steagall will guide your way through our mobile phone tour. To access the full features of the self-guided tour, dial 817-752-5415 and follow the prompts or visit cattleraisers.oncell.com on your mobile phone. Guests can also try their hand at our Scavenger Hunt and find the objects that go with the pictures in our galleries throughout the Museum. Christmas Eve and Christmas Day.